This French-inspired café conveys an atmosphere of refined intimacy. : Dark tones, romantic lighting, white tablecloths and brick floors structure a romantic setting for chef Margot McCormack’s singular cuisine. Inside a converted service station, the brick walls are bedecked with copper pots and open seating on the second level overlooks the bar. 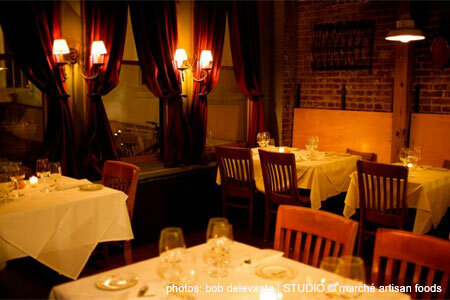 McCormack employs the best of Tennessee’s fields and streams to prepare the rustic but refined dishes inspired by Provence, Tuscany and her mother’s table. The menu changes daily, which might mean a rabbit pizza with wild mushrooms and fresh mozzarella, grilled North Carolina trout with braised kale and apples, and quail with bacon cheese grits. There are worse places to be on lazy summer Sundays than on McCormack's patio, enjoying a French 75 and breaking through the crusty French bread that cradles your poached eggs. As for the wine list, the selections range widely around the Mediterranean, and there’s a fairly deep after-dinner drink list as well. Dessert will be simple --- think salted caramel ice cream with pizzelle or a mug of hot chocolate with house-made marshmallow.